There are no such things as "wild" horses anymore. Research published in Science today overturns a long-held assumption that Przewalski's horses, native to the Eurasian steppes, are the last wild horse species on Earth. 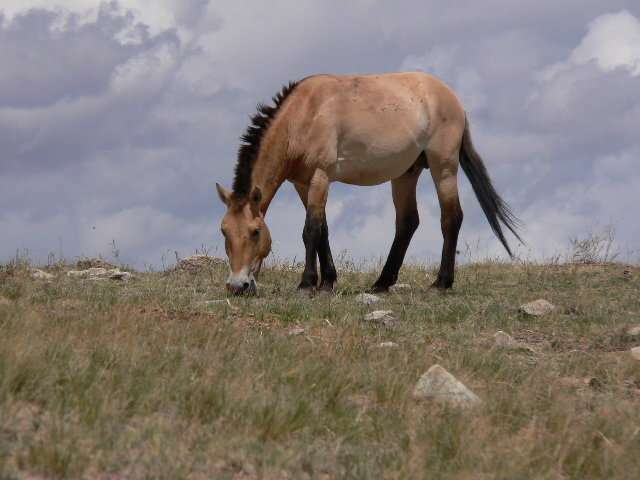 Instead, phylogenetic analysis shows Przewalski's horses are feral, descended from the earliest-known instance of horse domestication by the Botai people of northern Kazakhstan some 5,500 years ago. Further, the new paper finds that modern domesticated horses didn't descend from the Botai horses, an assumption previously held by many scientists. "This was a big surprise," said co-author Sandra Olsen, curator-in-charge of the archaeology division of the Biodiversity Institute and Natural History Museum at the University of Kansas, who led archaeological work at known Botai villages. "I was confident soon after we started excavating Botai sites in 1993 that we had found the earliest domesticated horses. We went about trying to prove it, but based on DNA results Botai horses didn't give rise to today's modern domesticated horses—they gave rise to the Przewalski's horse." "This means there are no living wild horses on Earth—that's the sad part," said Olsen. "There are a lot of equine biologists who have been studying Przewalskis, and this will be a big shock to them. They thought they were studying the last wild horses. It's not a real loss of biodiversity—but in our minds, it is. We thought there was one last wild species, and we're only just now aware that all wild horses went extinct." Some of the Botai horses were found to carry genetic variants causing white and leopard coat spotting patterns. Credit: Ludovic Orlando, reworked by Sean Goddard and Alan Outram. 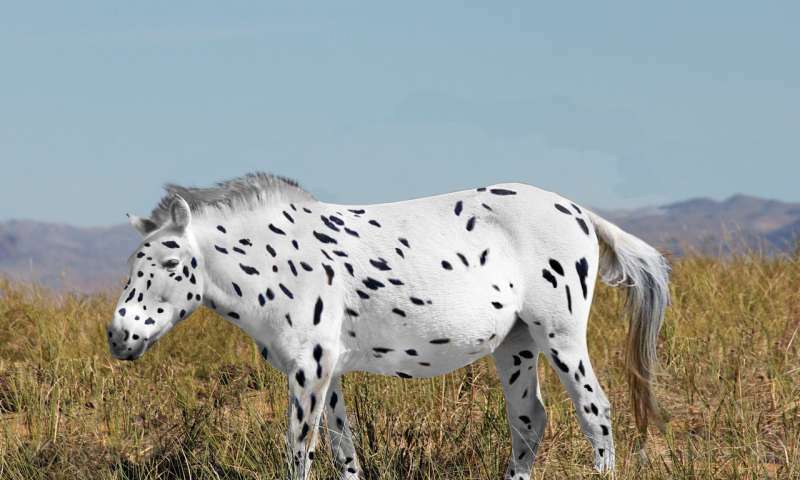 "Phylogenetic reconstruction confirmed that domestic horses do not form a single monophyletic group as expected if descending from Botai," the authors wrote. "Earliest herded horses were the ancestors of feral Przewalski's horses but not of modern domesticates." "What's interesting is that we have two different domestication events from slightly different species, or separate sub-species," she said. (The Przewalski's horse's taxonomic position is still debated.) "It's thought that modern-day domesticated horses came from Equus ferus, the extinct European wild horse. The problem is they were thought to have existed until the early 1900s. But, the remains of two individuals in St. Petersburg, Russia, are probably feral, too, or at least probably had some domesticated genes." 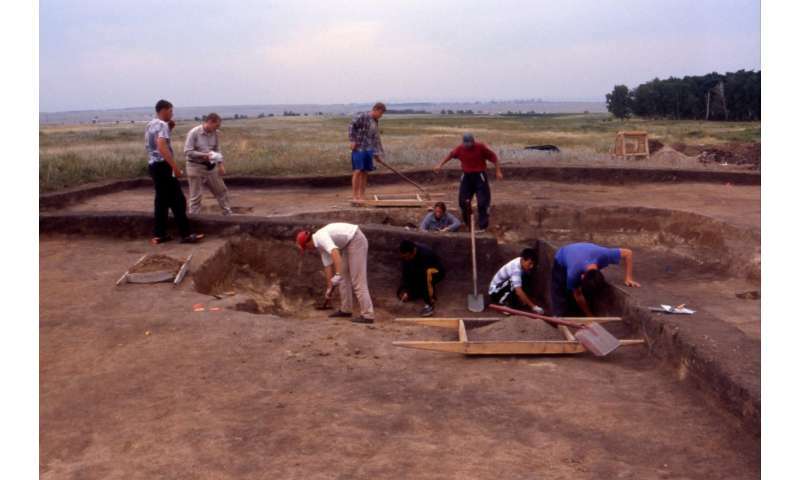 Olsen began excavating Botai village sites in Kazakhstan in 1993 after the fall of the Soviet Union made the region accessible to western scientists. Some of the horse remains collected by Olsen were tested as part of the new study showing their ancestry of modern-day Przewalskis. "Once they domesticated horses they became sedentary, with large villages of up to 150 or more houses," said Olsen, who specializes in zooarchaeology, or the study of animal remains from ancient human occupation sites. "They lived primarily on horse meat, and they had no agriculture. We had several lines of evidence that supported domestication. The fact the Botai were sedentary must have meant they had domesticated animals, or plants, which they didn't have. 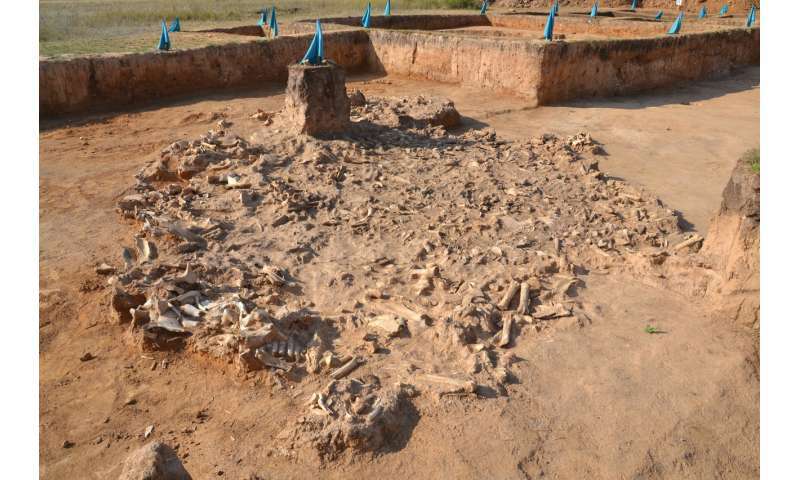 More than 95 percent of the bones from the Botai sites were from horses—they were in a sense mono-cropping one species with an incredible focus. If they were hunting horses on foot, they would have quickly depleted bands of horses in the vicinity of the villages and would have had to go farther afield to hunt—it wouldn't have been feasible or supported that large human population." The KU researcher also cited bone artifacts from Botai sites used to make rawhide thongs that might have been fashioned into bridles, lassos, whips, riding crops and hobbles, as further evidence of horse domestication. Moreover, the Botai village sites include horse corrals. "We found a corral that contained high levels of nitrogen and sodium from manure and urine," said Olsen. "It was very concentrated within that corral. The final smoking gun was finding residues of mares' milk in the pottery. It's commonplace today in Mongolia and Kazakhstan to milk horses—when it's fermented it has considerable nutritional value and is very high in vitamins." 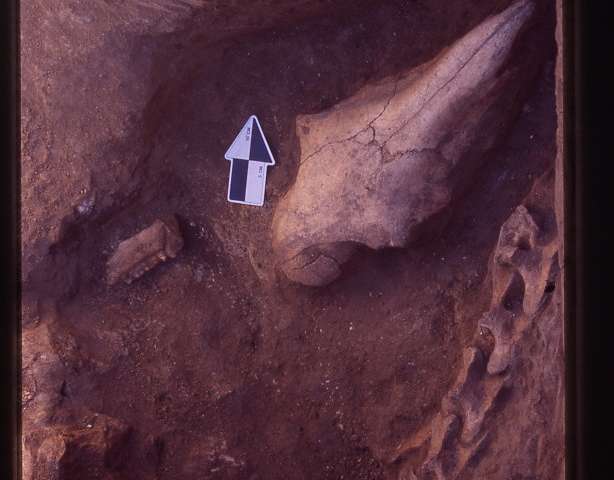 Interestingly, Olsen found that after slaughtering horses, the Botai buried some horse skulls and necks in pits with their snouts facing the southeast, toward where the sun rose in the morning in autumn. Mongols and Kazakhs slaughter most of their horses at that time of year because that is when they retain the most amount of nutritious fat in their bodies. "It's interesting because throughout the Indo-European diaspora there's a strong connection between the sun god and the horse," she said. "It may be that Botai people spoke an early proto-Indo-European language, and they also connected the horse to the sun god. Later in time, and this idea is in the historical record for the Indo-European diaspora, it was believed the sun god was born in the east and rode across the sky in a chariot, pulled by white horses. According to the belief, he would then die in the west and be reborn every day." "They started developing a semi-wild lifestyle like our mustangs, but they still have a wild appearance," Olsen said. "This is partly why biologists assumed they were genuinely wild animals. They have an upright mane, something associated with wild equids. They also have a dun coat, like the ones you see in the Ice Age cave paintings in France and Spain made when horses were wild. Their size, however, is very similar to what you see at Botai and other sites."